IT is one of the top music variety shows in town! With harmonies so tight that it will make your teeth hurt, the award-winning show “IT” starring the Hughes Brothers is an amazing presentation filled with the widest range of music than any other show in town. From country to pop to Broadway, the “IT” show has something for all ages in a full production show. The five Hughes Brothers, their five wives, and a stage full of kids hold nothing back as they dazzle your senses with great staging and lights as the world’s largest performing family. This isn’t just another big family showing off their kids; this is a world-class production with polished movement and dance, clear vocals, and stunning tight harmonies. We at Branson Ticket Deals like the show so much that we have a free shuttle included with adult tickets every Tuesday! Of course, we always have a great price and seats for any of their shows! He is the living legend of Branson! Shoji Tabuchi had the first major production show in Branson with dazzling special effects, dance, stirring music, and plenty of talent. In December of 1991, Shoji was featured on the TV show 60 Minutes for his flashy production and popularity. Thanks to that show, Branson exploded with an additional 3 million tourists in one year! He is noted as one of the finest violinists in the world and enthralls with memorizing classical music then burns the bow to high-stepping, country fiddling while his daughter and cast of singers and dancers lighten the stage. Branson Ticket Deals has amazing seats just waiting for you! Ask for our Sunday matinee special. 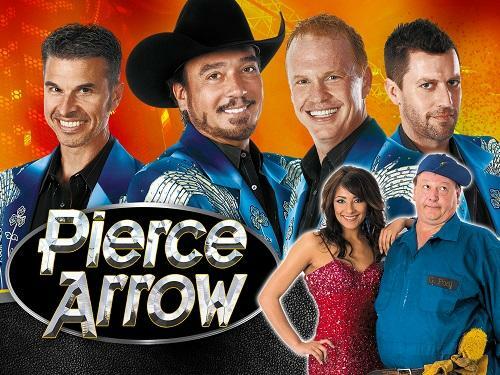 There are multiple reasons that Pierce Arrow is one of the longest running musical shows in Branson including the big vocals and big laughs. This four-part harmony group entwines tight vocals and powerful voices for a musical show with top-notch, seasoned performers. For almost 20 years, owner and bass vocalist, Dan Britton, held the world record for the lowest note ever reached. Be careful with injuries from the huge laughs inflicted by comedian James Sibley. He isn’t just some goofy jokester; James is a world traveled pro having cruised the world as a headliner on ships and a comedy actor in “My Name is Earl” and the movie “Mr. Woodcock.” Branson Ticket Deals has a whopping $6 savings on adult tickets and ask for our show special to get even more! What shows are you going to see this summer with Branson Ticket Deals? Share with us on Social Media!